Have I mentioned I’m in a panic as summer is drawing to a close? Granted, it’s still going to be hot here for another 6 weeks, but rather than focusing on the glorious fact that this week is the start of college football season (my favorite season), I seem to be lamenting that before I know it, I’ll be donning wool socks and unsealing my space bags full of sweaters. It’s a bittersweet time of year for me considering I’ve begun to realize that I’m not at all a fan of weather below 50°F and that my life is less-complete without eating 2 cups of peaches and berries everyday. Luckily, the high is 90°F today, our daylight lasts well into the evening and as Isaac is reminding us, it’s still August. I’ve got some ripe tomatoes on the vine outside that have so far escaped the jaws of chipmunks, birds, squirrels and pugs and the AC is still humming around here. So this recipe is still a relevant summer favorite that you can make before the leaves change. I suppose you can make it after things begin to cool off but I start craving slow-cooked, braised things come October. 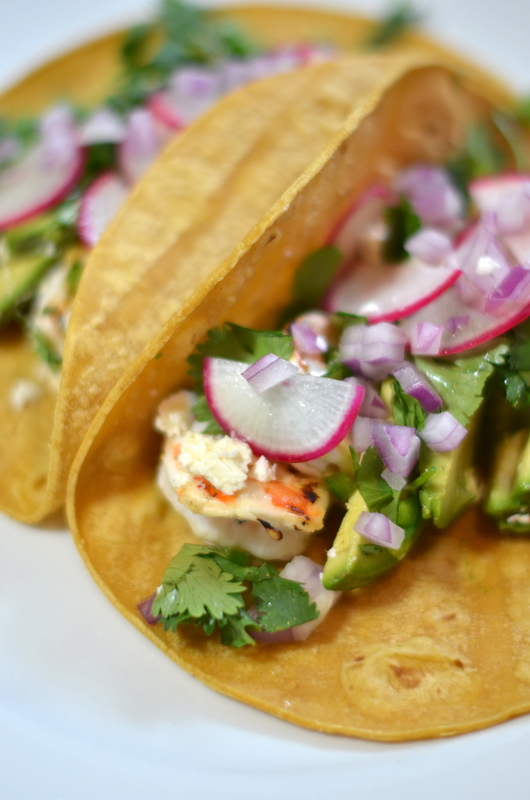 This is a super-simple idea for marinated grilled shrimp tacos. The measurements, like many of mine, can be fudged a bit. Don’t worry so much about quantities as just getting the flavors right. 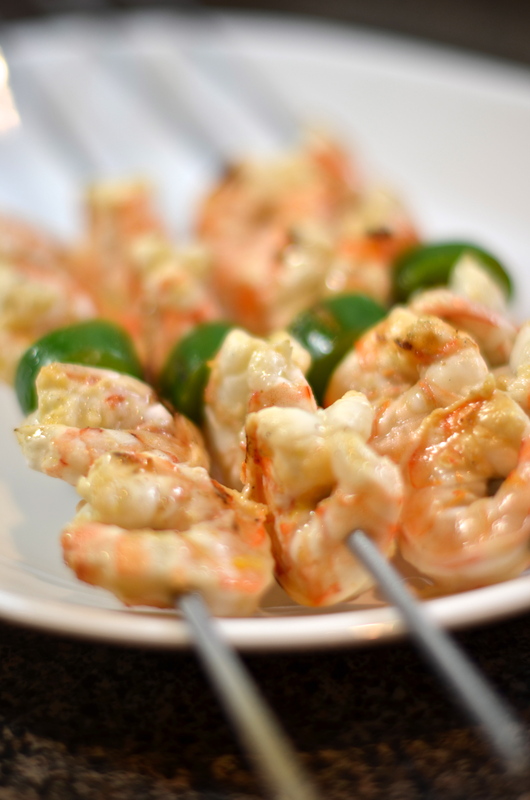 Start by addressing your shrimp. If you didn’t buy them pre-done, peel and devein them and stick them in a medium sized bowl. Add the citrus juices, cilantro, garlic, jalapeño and salt. Stir, cover and let sit in the fridge to marinate for about 90 minutes. While they’re marinating, you can prep all your garnish. I like the flavors I mentioned above, but you can do as you please. I’m not the taco police. Yet. 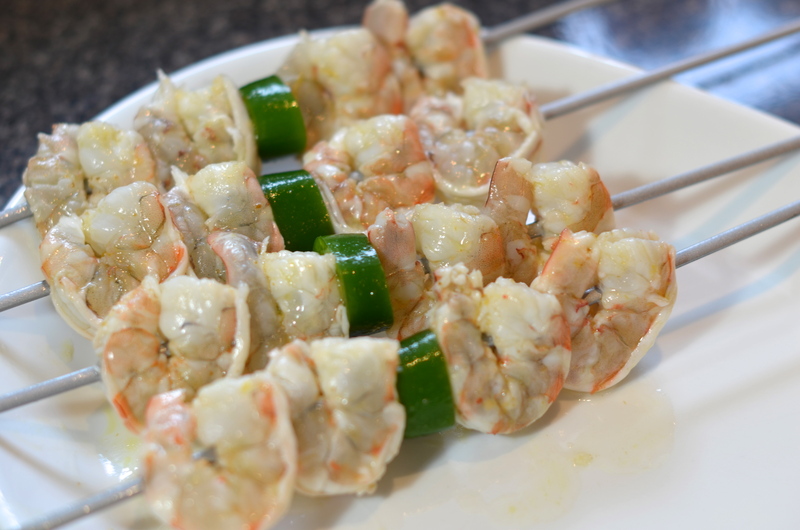 When you’re ready to grill the shrimp, grab a couple skewers and go to town. I like to add some of those big slices of jalapeño too. Not mandatory. Oil up the grates of your grill and cook these over direct heat for no more than 2 minutes per side. They’ll be pink and a bit charred and will be firm to the touch without feeling like you’re poking an eraser. A strange analogy, yes, but apt – both for effect and school-seasonality. I really wanted to make my own tortillas for these but rumor has it that the masa I need is somewhere on Buford Highway. I just haven’t had the energy to drive all that way yet but am planning to do so soon. I have a tortilla press that needs breaking-in. 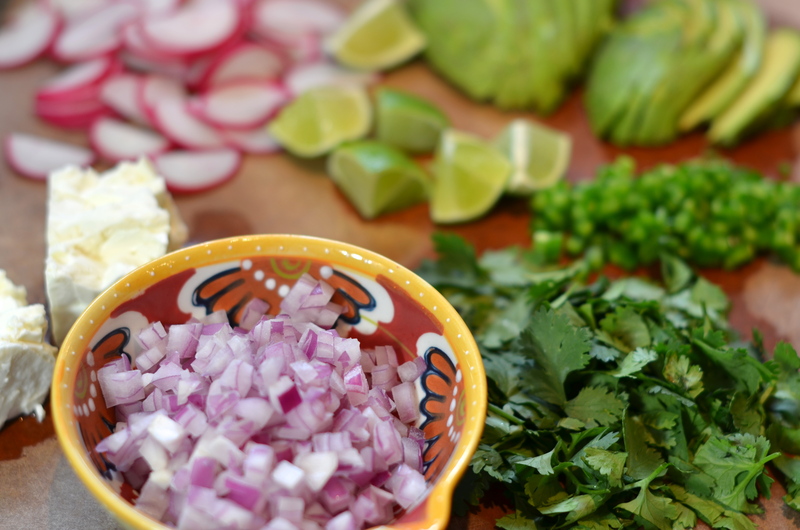 Assemble your tacos as you see fit. Here are mine. 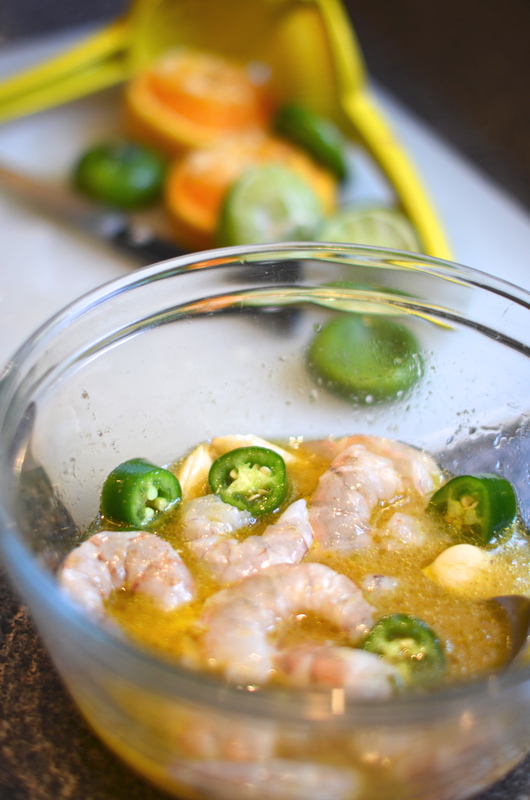 As I look at these, I also think that this would be a great marinade for grilled fish tacos too. Just get a fish with some body (mahi mahi, swordfish, grouper) and marinate and grill. I’d go for flour tortillas for that. Maybe I’ll make those this weekend with some refried black beans and corn salad. These look delicious! I will have to try them! Thank you – I hope you do. Thank you for stopping by the blog! I wish I had a grill – S I G H. I’m also kind of dreading the end of summer. I love being outdoors and enjoying the sunshine, but I also love sweaters and being able to have hot coffee in the morning without dying. It’s bittersweet! I suppose one of the best things about living in a less-densely populated area in a house with a yard IS a grill. I take it for granted! You could totally broil these or grill pan them though and get the same effect. They don’t cook on the grill long enough to really impart any significant grill flavor so you won’t lose much by moving the whole shebang inside.